Bestor’s Blackbirds: The Woonerf Lands in L.A. The hills of Los Angeles’s Echo Park neighborhood are carved by steep narrow roads and studded with oaks, eucalyptuses, and neon bursts of bougainvillea. A quiet, sleepy air pervades the sidewalks, which run by faded stucco apartment buildings and modest Craftsman-style homes tucked behind dense foliage. A few trendy cafes and boutiques are scattered along the main street, and a coyote sighting isn’t so unusual. The neighborhood is a leafy haven from the visible skyscrapers of downtown and the constant flow of cars along Sunset Boulevard and three nearby freeways. 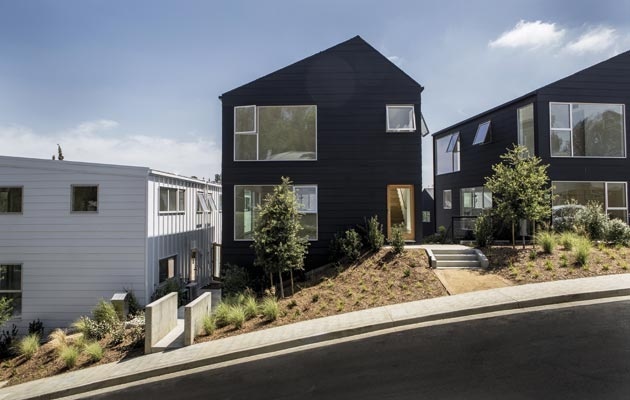 Here, on one of the more vertiginous slopes, is the newly completed Blackbirds development, a “micro-neighborhood” of 18 homes designed by local architect Barbara Bestor, with landscaping by Mia Lehrer + Associates and developed by LocalConstruct. Named for the way birds gather around a bird-feeder, the houses ring a spacious paved area, or “living street,” that residents will share. Sharing is not exactly endemic to Los Angeles homeowners. Instead, for decades the city was an epitome of that frayed American dream: a single-family home and a two-car garage, bordered by lawns and a fence. The result has been an endless outward expansion of neighborhoods until they touch desert, and lengthening commutes from home to work. Density is still a taboo word to many; in Echo Park, some of Blackbirds’ neighbors have fought the development. When I visited, several protest signs on neighboring lawns demanded a moratorium on small lots, citing increased traffic and “loss of privacy.” But the city’s population keeps rising (it’s expected to grow by a third by 2050), and the low-to-medium density infrastructure is straining to keep up. 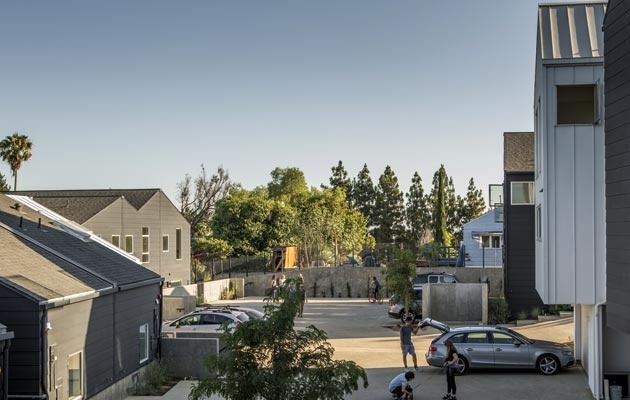 A decade ago, the city overturned regulations that had stifled infill construction, and gradually, higher density “small-lots” housing is both responding to, and anticipating, changing needs. Blackbirds is the first multi-family housing project Bestor designed, but her familiarity with the neighborhood was deep, having lived just up the street for years. She envisioned replicating the Craftsman bungalows of Echo Park, providing for plenty of space and plantings between them. Sensitivity to the neighborhood’s character led Bestor to pursue what she termed “stealth density.” Although Blackbirds consists of 18 separate houses (mostly sold, but still unoccupied at the time of this writing), none of which share walls, they are gathered into only nine structures. The gaps between the houses are covered to make multiple units appear seamless. The disguise works. What could have been a congested development is instead pared down and spacious, both inside and out. Bestor chose to clad the houses simply, in black or white, and clustered them around the central open area. From a high aerial view they might look like boulders in a Japanese rock garden. “I tried to make a high-quality compression,” Bestor told me when I visited her firm’s office, housed in a slender triangular building painted hot red and yellow. She used the tech-industry term for compressing data without losing quality to explain how she reduced space yet retained a sense of style and craftsmanship. (Such analogies are in the air: another local Los Angeles architect recently described his small-lots projects as “the iPhone of houses.”) At Blackbirds, the bedrooms are modestly sized, but feature dramatically faceted high ceilings and floor-to-ceiling windows that make the spaces both visually interesting and full of light, while bringing the hillside views up close. Along the open-plan kitchen and living room, tall built-in bookcases double as a supporting wall along the staircase, which is narrow but steeped with light from a skylight. Besides Bestor’s innovative single-family houses, and popular dining, office, and retail spaces, she has also restored several midcentury masterpieces around Silver Lake, including houses by John Lautner, Gregory Ain, and Rudolf Schindler (her “favorite ever”). Seeing and working within such paragons of West Coast modernism offered a wellspring of ideas. Most relevant to her work, she told me, was the modernists’ lean sense of scale and seamless blending of indoor and outdoor spaces. She wields both tactics well, and they are deftly represented in Blackbirds. In fact, one of the bedrooms there, with its two adjacent walls of mostly glass, are reminiscent of Schindler’s 1940s rooftop “sleeping porches” that offered outdoor slumber. The “living street” between the houses comes from the Dutch concept of the woonerf, known in England as a “home zone.” The first example of a woonerf—a space where pedestrians, bicyclists, and cars can comingle equitably and safely—was created in the Netherlands in the 1960s. The lack of traffic signage, sidewalks, or lane dividers in woonerfs means that motorists and pedestrians must communicate, making eye contact to determine the right of way. For some, that increased cooperation is the point. Today there are over 6,000 woonerfs in the Netherlands and the idea has spread globally—from Hungary to New Zealand. Los Angeles, where the car is king, has been slower to adopt it. A few years ago the first woonerf-inspired project opened along two blocks in the Santa Monica neighborhood. Blackbirds introduces the second. Early plans for Blackbirds’ open space included a community garden and barbeque area, but it was decided to leave such cooperative endeavors for the future residents to work out instead. “Once the cars drive off for the day,” says Bestor, “the woonerf transforms into a place where kids can play or ride bikes. There could be a weekly farmers market. The neighbors can decide its use.” In other words, it’s a blank slate. The woonerf concept is also in synch with citywide efforts to dramatically increase access and safety for pedestrians and bicyclists in one of the world’s most infamously car-centric cities, such as the recently announced “Mobility Plan 2035” which will add over 100 miles of traffic calming measures along major corridors. Although Blackbirds’ woonerf is on private property, it mirrors a larger ethos of trying to diversify uses of urban space. While not intended to be luxury housing, the price of the Blackbirds homes—driven up by a highly competitive housing market and the caché of Bestor’s name—might normally guarantee high-end amenities like a pool, a trophy master bedroom, or a four-car garage. Or just bigger everything. Brown suspects Blackbirds will appeal to homeowners who care about good design but are willing to downsize for the sake of other qualities, like the character of the neighborhood, making a smaller footprint, or the potential of communal space and a more neighborly lifestyle. Published in Icon, October 2015.